First place the bacon in a fry pan filled with water with just enough water to cover the bacon. Then place the pan on the burner (at high temperature) and let it cook. Cook it till it snaps and hisses at you and then reduce the burner to medium. The water cooking allows it to be fully cooked without browning so there will be no burnt outside and it will still be chewy inside. On a side note after you see the bacon shrink a bit you can wash the pan and bacon and then put bacon back in the pan to continue to cook. 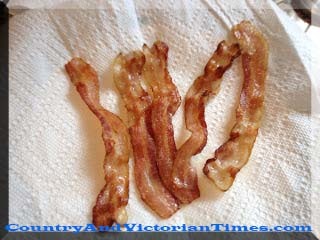 This way you will loose some of the grease and bacon will be a little healthier to eat. You can also do this with ground hamburger that will be seasoned. This entry was posted in Health & Medical, Recipes, Tid-Bits & Funnies, ~Breakfast, ~Dieting, ~Food and tagged alternative, Bacon, cook, cooking, Diet, fat, Frying pan, Health, less, trans fat, water, ~Healthy. Bookmark the permalink. 9 Responses to Boil Bacon In WATER? I hope you enjoyed this article – it is always great to learn when you can cut off just a little tomake what you really want to eat that much healthier for you! Thanks for stopping in and am glad you found the article! Your welcome – glad to find such good information I could share! This posting, “Boil Bacon In WATER? | Country & Victorian Times” illustrates that u actually fully understand everything that u r speaking about! Bacon In WATER? | Country & Victorian Times” with my own good friends on twitter. “Boil Bacon In WATER? | Country & Victorian Times” was indeed a great post.